Welcome to North Andover, Ma! The Town of North Andover is home to almost 30,000 people and is located in Essex county Massachusetts on the beautiful banks of the Merrimack River. North Andover is also only 24 miles from downtown Boston. The town is 27 square miles comprised of sprawling hills, extensive open spaces, gorgeous homes, many residential neighborhoods and businesses all within a stones throw of the scenic Lake Cochichewick. North Andover was selected by Money Magazine in 2003 as the “Fifth Best Community to live in on the East Coast”. The town is most proud of all the services it is able to offer its residents through the places such as Stevens Memorial Library and The Department of Youth Services. The Department of Youth Services provides recreational opportunities at Stevens Pond and extensive programs at the Youth Center located in the Old Center. Also, a vibrant Senior Center, located behind Town Hall on Main Street, provides services, programs, and assistance to over 6,000 seniors. North Andover takes great pride in providing an excellent education for all students through its public school system which includes five elementary schools, one Middle School, one High School, and the Greater Lawrence Technical School. The “North Andover High School Scarlet Knights” carry a rich tradition of competition and sportsmanship through all its athletic endeavors and The North Andover High School marching band, chorus, drama, arts programs, and other extra-curricular activities provide excellent learning opportunities and experiences. The Town of North Andover is committed to attracting new businesses - small and large. 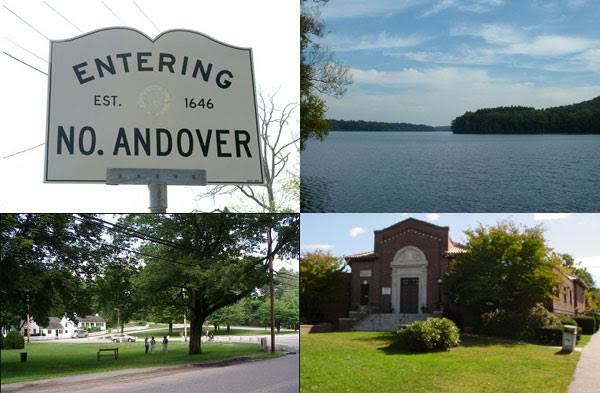 The excellent geographic location, endless source of talented workers, citizens and volunteers dedicated to their community, and the natural beauty of the town make North Andover a spectacular place to live! Call us for a personal tour of North Andover. N Andover's most magnificent residence and offered to the open market for the first time! A sweeping private drive leads to the glorious manor estate. Its 5+ breathtaking acres offer water views of Lake Cochichewick from the many romantic balconies and gracious rooms. Meticulously landscaped with an infinite pool, stone cabana and pathway leading to your private lake front paradise. This European-inspired, 3 level home offers abundant space & privacy, w/exquisite inlaid hardwd & marble flooring, marble/ limestone FPs. Intricately-carved millwork, ornate coffered ceilings and hand painted ceiling domes. Fabulous hi-end kitchens all with premier appliances (main and family room level) along with a custom butler's pantry to include Miele coffee center. Grand 2 story great room, formal living & dining rms all looking onto the palatial front entry accented by a spectacular floating staircase. Bedroom suites offering an array of private balconies, fireplaces and lake views. THIS IS YOUR OPPORTUNITY TO OWN A 5 MILLION DOLLAR PROPERTY FOR $2,995,000 MILLION. This home has every extra that you could possibly desire. Magnificent kitchen with 48' Wolf 6 burner gas cooktop with grill and griddle. Two Subzero refrigerators. Miele dishwasher, coffee/expresso maker, steam and speed ovens. Plus two Miele wall ovens. Additional freezer, refrigerator and warming drawers. Amazing pantry area. Master suite with 9 closets, 2 with Railex systems. Ultimate master bath with shower steam room and sunken whirlpool tub. Private library or office with separate entrance. All bedrooms have their own private baths and loads of closet space. Live-in suite has its own entrance. Stunning stone and copper exterior with beautiful roof lines, in-ground heated Gunite pool, outdoor grill area. Full guest house with bedroom, living room, eat-in chef's kitchen with high-end appliances. Welcome to this european Gascony-style French country manor. Stucco exterior with copper cupola and finials, wrought iron curved staircase, reclaimed wood beams with limestone floors presents the casual elegance of Provence yet offers today's luxurious amenities. Sited on an exquisite 2 acre level lot at the center of the cul-de-sac abutting the North Andover Country Club. Kitchen boasts a large center island with top of the line appliances, walk-in pantry with great flow for cooking and entertaining. Butlers pantry joins the kitchen and DR with 10' ceilings and ceiling to floor windows. LR has an imported limestone mantle with wood burning FP. Adjacent FR encompasses the kitchen area with gas FP and open floorplan. First floor master bedroom wing with custom trayed ceiling, individual closets and master bath retreat. Generous sized bedrooms, all en-suite. Sunlit gallery with triple french doors leads to the private stone patio and manicured yard with european gardens. Breathtaking! Spectacular NEW CONSTRUCTION home being built within the popular Autumn Chase cul de sac neighborhood. This special lot has a wooded backdrop surrounding the home with over an acre of land and a house location set back on the lot. The floor plan has the spaces and open floor layout that adds to a great flow. The finished third floor has the flexibility of being a fifth bedroom suite (with the bedroom and full bath), media room or separate office space. Lot's of storage too. The lower level has a walk out and the potential for future finishing. Enjoy the custom detailing with hardwood flooring on the first and second floors, moldings, coffee bar and pantry added in the kitchen and 2 fireplaces. This lot has the room to accommodate a pool and has scenic views from the deck. Great location near the Old Center and commuting routes. North Andover has so much to offer with a vibrant downtown, the Old Center and Youth Center and public and private schools. Come live the good life! Totally renovated medical space for sale at the North Andover Office Park. Suite has 13 exam rooms, several private offices and three rest rooms with two reception areas and plenty of room for storage. The suite is in immaculate "move in" condition. The office park is located across the street from Merrimack College, less than one mile from RT 495 (Exit #42) with direct access from both Turnpike Street and RT #125. The office park has approximately 450 parking spaces and is zoned for both medical and office use. The building is fully handicap accessible. This is an amazing opportunity to purchase completely built out medical space that is in "move in" condition. This beautiful family home is located on a quiet cul-del-sac one mile away from the Old Center and waling distance to Annie Sargent School. Two story foyer with circular staircase, elegant dining room, newly renovated gourmet kitchen, gas fireplace in 800 sq ft great room with cathedral ceiling. Both bathrooms newly renovated and second floor laundry. Finished LL. Patio and fire-pit for entertaining. HOUSE TO BE CUSTOM BUILT BY BOYLE CONSTRUCTION $925,000 and up!! Bring your plan or use ours. Understated elegance, craftsmanship throughout with all the upgrades you would expect and much more! SPECIAL FEATURES INCLUDE: Hardi plank siding, spray foam insulation, built-ins, custom cabinetry, custom trim throughout! Details rarely seen in today's new construction..Generous allowances--YOU WILL NOT BE DISAPPOINTED!! Great opportunity to build your dream home in a great location! ALL PICTURES ARE FACSIMILE PHOTOS. Custom New Construction Overlooking Stevens Pond. Located around the corner from the Old Center and within sight of North Andover's town beach. Enjoy swimming, fishing and exploring Weir Hill from your doorstep. The modern, open floor plan and superb appointments enhance today's living. The enclosed vestibule beckons you to enter the sun-splashed great room with fireplace and panoramic water views. Entertain in the spacious country kitchen with upgraded cabinetry, large island with wine fridge, Bosch appliances and large dining area. Upstairs is a master w/tray ceiling, walk-in closet and an elegant master bath. 3 additional bedrooms + 2 full baths (incl a Jack & Jill bath) provide room for family and guests. The finished lower level bonus room is the perfect spot for games or a quiet get-away. Imagine experiencing sunrises over the pond from the over-sized windows and relaxing at day's end in the screened porch overlooking tranquil conservation land. Truly a home to admire.